Recently, three students were honored for their submissions to an international haiku contest. 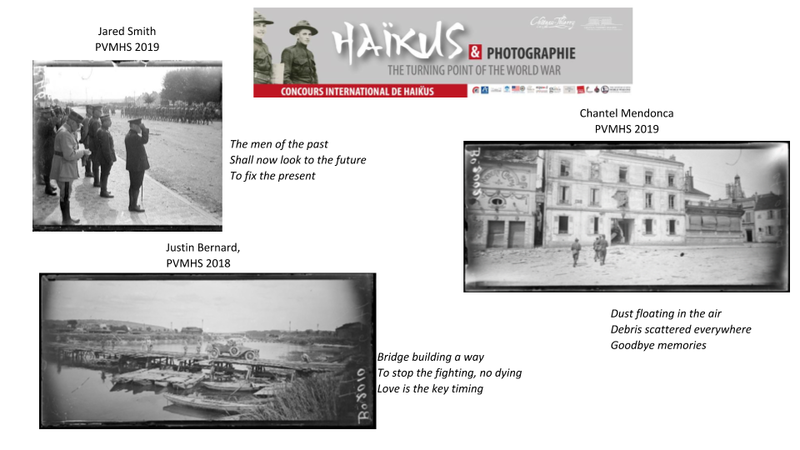 Students were asked to write a haiku based on historic photos of Chateau-Thierry from World War I. Poems were judged on their emotional impact, relation to the photos and as a form of remembrance. These honorees will have their poems displayed throughout the town of Chateau-Thierry, France, for the duration summer 2018. Their haikus were the only in English to be selected for display. Congratulations to senior Justin Bernard and juniors Jared Smith and Chantel Mendonca. All entries and photos are posted outside the C270.